Zetsche: No reduction in diesel demand in Europe. PARIS -- Daimler's Mercedes-Benz is speeding toward a future defined by autonomous vehicles, car sharing, connectivity and electric vehicles. 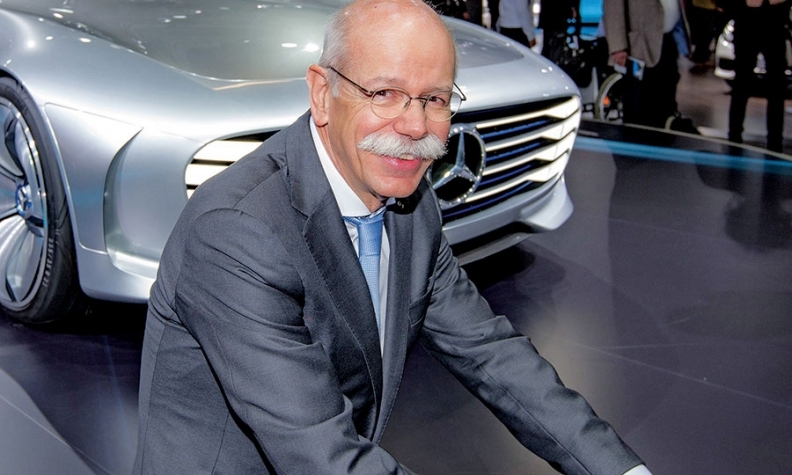 Indeed, Daimler CEO Dieter Zetsche says all that will upend the industry's traditional ways of doing business. But how will Daimler and the rest of the industry get there? For its part, Daimler has formed a unit to tackle opportunities that arise from those key trends. It's also readying at least 10 electric cars under a new subbrand in a bid to become the market leader in premium EVs by 2025. That doesn't mean the company is losing sight of near-term objectives. Daimler will continue investing in internal combustion engine technology, new models and additional capacity to support further growth. And it's on pace to topple archrival BMW as the world's No. 1 luxury brand this year, four years ahead of its own schedule laid out in 2011. And there is plenty more to occupy Zetsche's attention in the short term, including China, an upcoming pickup that is being considered for the U.S. and maintaining crossover and SUV supplies in the U.S.
At the Paris auto show on Sept. 29, Zetsche, 63, spoke with Automotive News Publisher and Editor Jason Stein, Automotive News Europe Editor Luca Ciferri, staff reporters David Undercoffler and Ryan Beene, and Correspondent Christiaan Hetzner. Q: The last time we spoke, you said that becoming No. 1 in volume was not your final target but was a result of doing a good job. So the job you've done has been remarkable. You're reaching the target in advance of your original plan. What went particularly well? A: There are certainly many elements to that, but probably the three most important elements I think are design, product portfolio and gaining a better understanding of China. These are the strongest levers, but definitely not the only ones. Well, based on growth rates in the high double digits for a couple of years now, I would at least call that "OK." We are running more or less even with BMW on a monthly basis -- there are months where we are a few units ahead, others where they're a few units ahead. It's quite an accomplishment as we've come from a time when our volume was about half their volume. Ultimately, the main deficit was probably a lack of understanding of China. We've fixed that. You said that by 2025, 15 to 25 percent of Mercedes' sales will be EVs. How will Daimler balance such a substantial investment in EVs with the current internal combustion engines and vehicle lineup? Of course, we have to continuously become more effective in our spending and we have to prioritize. But even if we are correct with that forecast that means, conversely, that 75 to 85 percent of our vehicles will still be combustion engine-driven, plus plug-in components. And if we are not totally competitive with these products the whole equation won't work. So we cannot fall back in the investments into the latest technology in combustion engines, either. But that's the character of any transition into a new technology. What is the future of diesel, which is mainly a European issue? Talking about Europe, we have just launched a new diesel engine, the OM 654, a very good engine, not only in terms of emissions. Today it fulfills the stricter emission limits planned for the EU as of September 2017. We started to develop that five years ago independent of any current discussions, which is a proof point that diesel engines today can, for practical means, be nearly as clean as gasoline engines while continuously offering 15 percent better fuel efficiency and this means a better CO2 footprint. It would be stupid to forgo this opportunity. So there's no downside coming with leveraging this opportunity of better fuel efficiency, and that's why we will continue to sell them. And as far as the market is concerned, within the last year -- the whole story started at the Frankfurt motor show a year ago -- we, and the same applies to BMW, have not seen one basis point of reduction in customer demand as far as the take rate of our overall cars in Europe. So the customer looks at it just the same way as we do. How does the U.S. look in the back half of this year going into next year? The U.S. market is kind of moving sideways, but still at a pretty attractive level. This is accompanied by a very strong ongoing shift from cars to light trucks, which traditionally we could observe in phases of low gasoline prices, but it's very pronounced right now. So none of that is totally surprising, and within this environment we are not seeing big growth for us, but we are seeing relative market share gains compared to our peers in the premium segment, which is probably the best you can accomplish at this point in time. Dietmar Exler, CEO of Mercedes-Benz USA, has received more allocation of crossovers and SUVs this summer and it's starting to help with the shortages that he has had. How has Mercedes balanced that allocation? We have been building up capacity almost continuously. You see where we are in the cycle -- it's pretty amazing that we still sell at full capacity. On the one hand, of course, you have to look at the profitability of the different markets. On the other hand, you cannot switch markets on and off as you'd like. You have to be loyal to your customers and try to avoid growing dissatisfaction caused by a lack of supply. The U.S. is so much of a light-truck and SUV market that it would be very shortsighted to cut volumes over-proportionally versus other markets where you might have better margins. So we try to do the best job for the U.S., but still we have a shortage. Has Mercedes decided whether to sell a pickup in the U.S.? We investigate together with our sales organization and our dealers if there is an opportunity in the U.S. market. We do believe that what has happened with SUVs a long time ago can happen on the pickup side as well, that a kind of a premium segment develops. The question is if that applies for the midsize segment, or if that's more likely in the full-size segment where we are not planning a product at this point of time.